Curmudgeonry: Let's Play What Is It? I have a mystery plant. Actually, there are two of them planted fairly close together in my driveway bed. They look as if I planted them intentionally. I probably did. They were there last year, but I don't remember the plant blooming. This year it looks as if it is going to soon, unless the shaggy green things are the flowers. Whatever it is, I kind of like it, but I have no idea what it is. I can tell you what every other thing I've planted is. I like to know what I have. This one though has me stumped. Please help. Tell me what's growing in my garden. Earth Girl and Patricia, I'm looking in your directions. But anyone else is free to jump in with an opinion or actual answer as well. Update: There is a little pink bud on one of the plants and I am beginning to suspect that these may be Sweet William. I still don't remember planting them, but I'd be happy if this is the case, because Sweet William is so pretty. I am not sure, but I'll definitely ask my husband. He worked in a plant nursery through high school, so there's a good chance he will at least know in which family of plants it belongs. I would love to have his opinion, Amy. those are sweet williams! I have some too and I can not wait for them to bloom. I planted the seeds last year and they flower the second year (i'm sure you already knew that part though) i just read a few of your entries and i love your site! 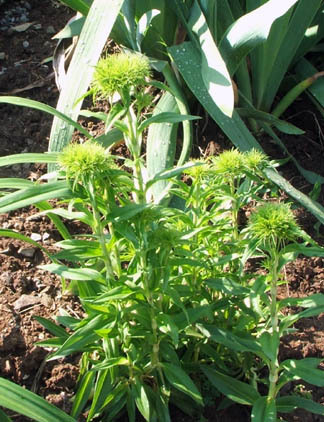 I just saw the post and recognized it also as Sweet Williams or Dianthus barbadus, one of my favorite self-seeding biennuals. Yes, you might find it springing up anywhere in your garden, but it transplants easily.